It is June 24, 1981 when Our Lady appears for the first time to 6 young people from Medjugorje, a small and remote rural village of communist Yugoslavia. 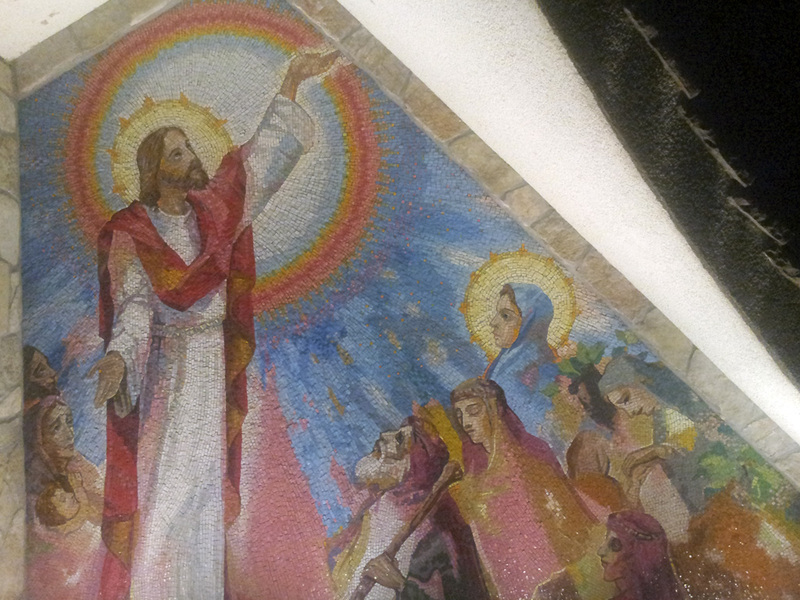 Since then the Apparitions have never stopped, bringing messages of peace, prayer and conversion into the world. Millions of people have arrived and continue to arrive in this place of Mary attracted by the phenomena that happen to you and the particular atmosphere that you breathe. 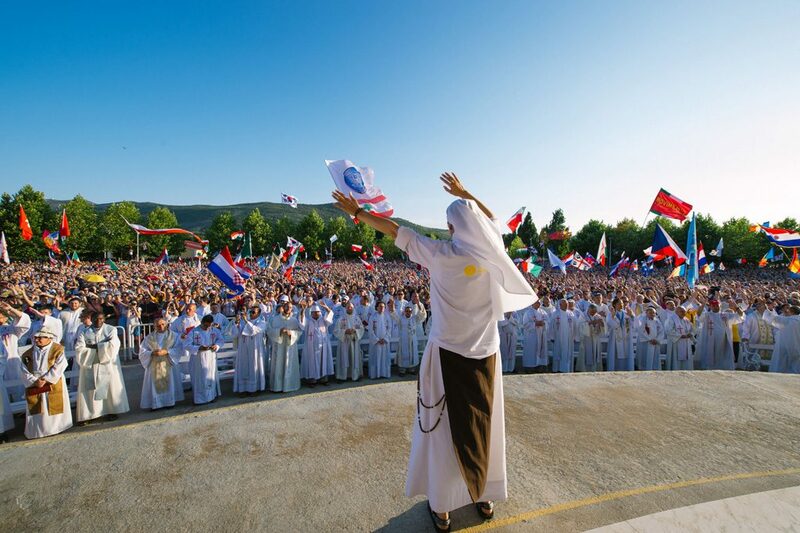 Sacred places, healings, conversions, profound spiritual changes, small and great gestures of solidarity and mercy: this is the Medjugorje of the faithful and pilgrims, and there are many attractions that enrich the spiritual journey of every visitor. 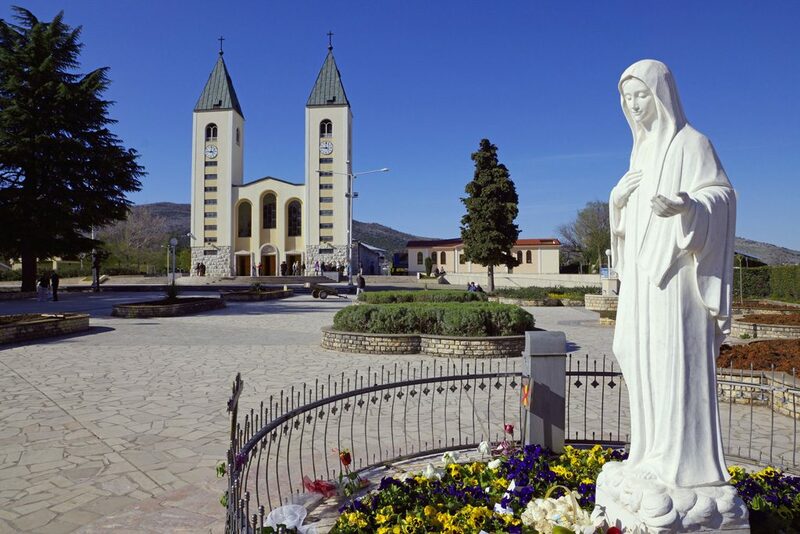 Medjugorje is a small town in the municipality of Čitluk, in the southern part of Bosnia and Herzegovina. The village is located a few dozens of kilometers from the Adriatic Sea and about 25 km from Mostar, the capital of Herzegovina, at an altitude of about 200 meters above sea level. The name Međugorje means “among the mountains” and in fact the village is located at the base of two hills, Križevac and Podbrdo (also called Apparition Hill). The climate is typically Mediterranean characterized by rather hot and dry summers and cold and wet winters. 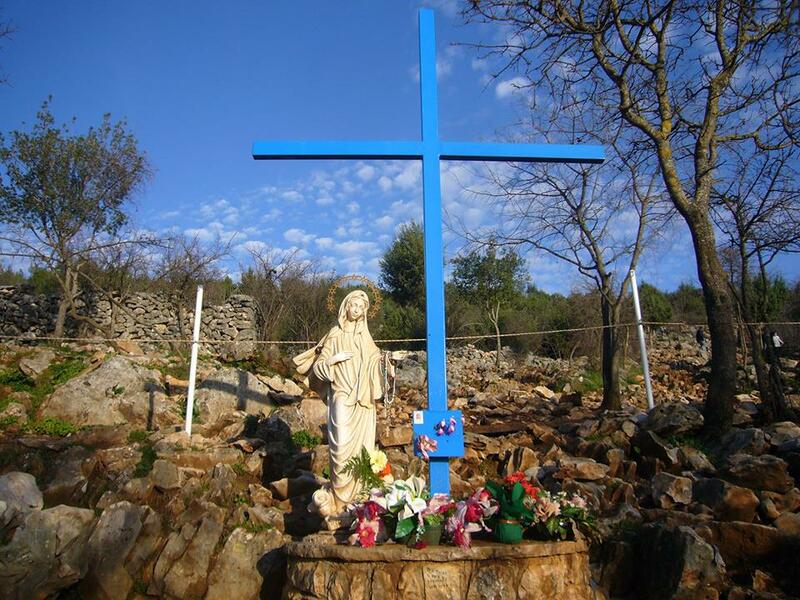 Medjugorje has about 4000 inhabitants, mainly of Croatian ethnicity and of Catholic religion. 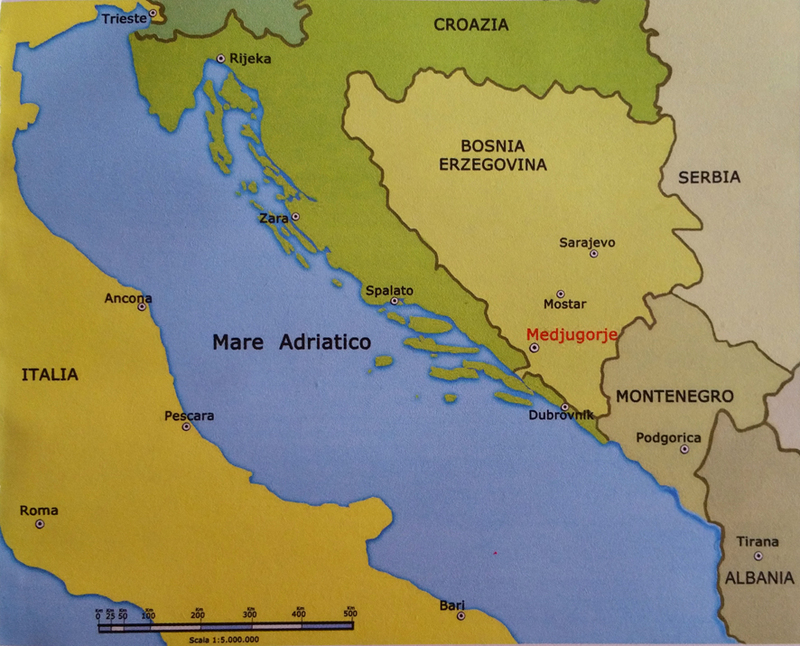 The parish of Medjugorje is also responsible for the villages of Bijakovići, Vionica, Miletina and Šurmanci. Its patron saint is St. James, which gives its name to the famous church of the village. What to see in Medjugorje? It is the place where the first apparitions of Our Lady took place, a bare and stony hill overlooking Bijakovici, the area of ​​Medjugorje where the little visionaries lived. In the early years the top of the hill could be reached by a narrow and almost impassable path, crossed only by shepherds and sheep, but thanks to the millions of pilgrims who attended it today it is wide and free of obstacles. As they climb the hill, some even barefoot as a sign of sacrifice and devotion, the pilgrims recite the Holy Rosary and meditate on the mysteries. To facilitate this contemplation, over the years the Podbro path has been enriched with 15 bronze plates made by the Italian sculptor Carmelo Puzzolo depicting the joyful, painful and glorious mysteries. 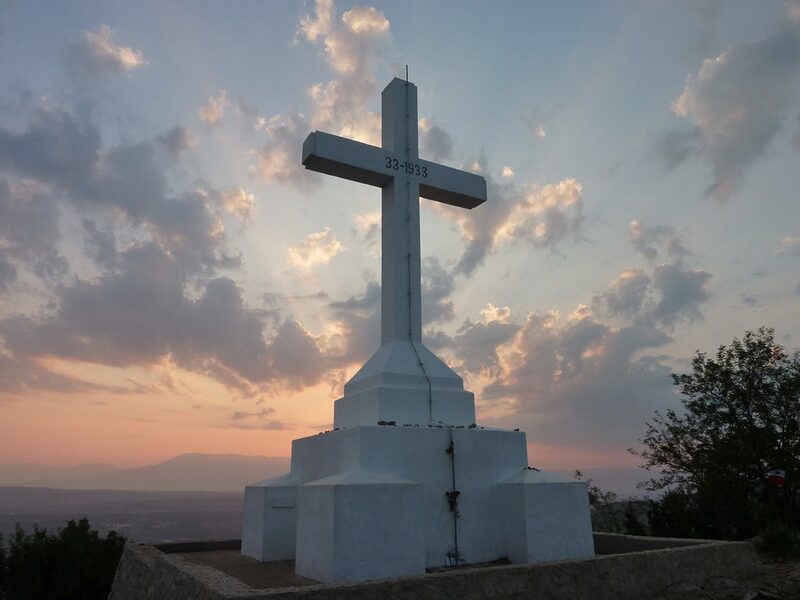 The hill can be reached from the center of Medjugorje in about 15-20 minutes on foot, while the climb takes about half an hour. It is not difficult or particularly tiring but the ground is stony and steep: we recommend suitable shoes and firm step. At the foot of the hill Podbrdo a simple blue cross was placed right where the Virgin Mary showed herself to the visionaries during the first Apparitions, in order to protect the 6 youngsters from the police who pursued them and waitetd for them on top of the hill. The Blue Cross is located about 30 meters from the village road and is accessible to all pilgrims, even the elderly and sick. 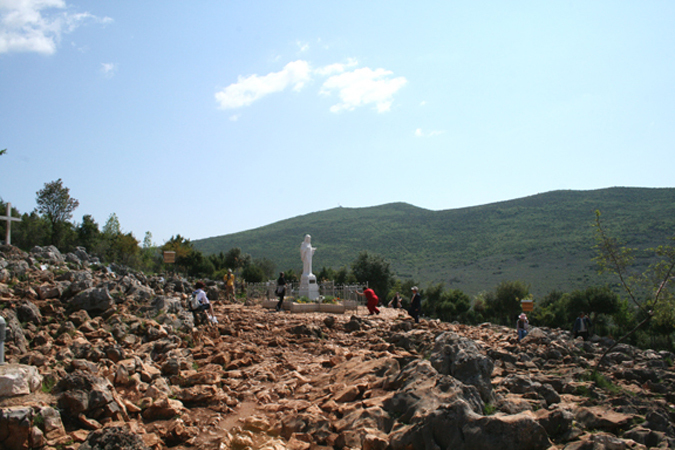 People who can not climb the hill stops to pray here, one of the symbolic places of Medjugorje. Krizevac is the highest mountain in Medjugorje (520 m above sea level). On March 15, 1934 the parishioners built a 8.5-m high reinforced concrete cross to commemorate the 1900th Anniversary of Jesus’ passion and death, and engraved the words: “To Jesus Christ the Redeemer of humanity as a sign of faith, love and hope, and in memory of the 1900th anniversary of the Passion of Christ”. A relic of the True Cross of Jesus was received from Rome from Pope Pius XI and was built into this cross. All the material necessary for the construction of the cross was carried with great effort on the shoulders of hundreds of parishioners, men, women and children, along a tortuous and impervious path. Every year the Feast of the Exaltation of the Holy Cross is celebrated on the first Sunday after September 8, the feast of the Nativity of the Virgin Mary. To get to the foot of the Cross you must follow a rather steep, impassable and difficult stony path, along which 14 simple wooden crosses have been placed. In 1987 next to these crosses were also placed some bronze reliefs representing the Via Crucis made by the Italian sculptor Carmelo Puzzolo. At the beginning of the Apparitions on this mountain unexplained phenomena and signs took place. It is the parish church of Medjugorje, center and hearth of the spiritual life for pilgrims and parishioners. The first church was built in 1897. It was built on an unstable ground and since the end of the First World War the possibility of building a new church is taken into consideration. The works lasted from 1934 to 19 January 1969. Since 1981, with the arrival of an increasing number of pilgrims, new needs have arisen that have led to subsequent renovations and to the construction of the external altar and the area surrounding it. The area around the church is the place for the celebration of the Eucharist and sacral life. Here in 1991 a small chapel was built for adoration of the Blessed Sacrament, twenty confessionals, and spaces for lessons and spiritual talks. Two pavilions were also built for special celebrations, but there is still a need for new rooms to be used for sacred uses. On the square in front of the Church stands a marble statue of the Queen of Peace created by the Italian sculptor Dino Felici. 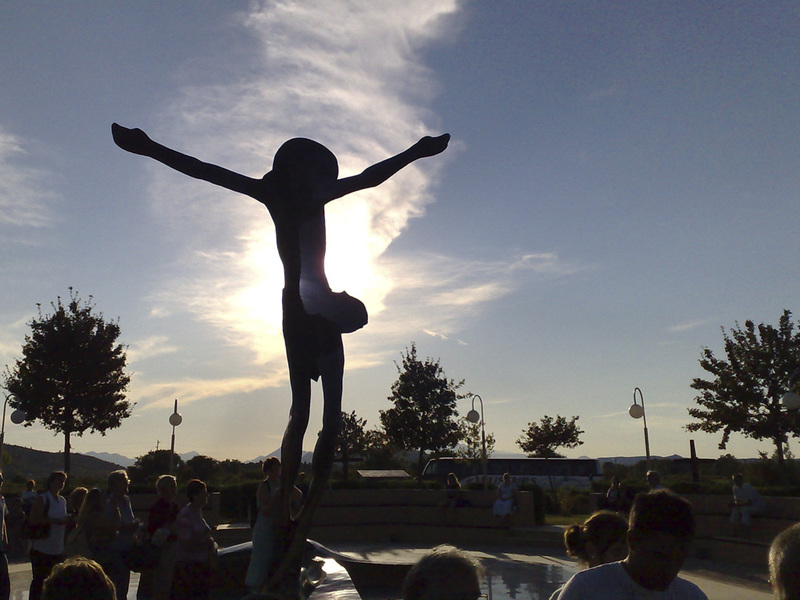 Behind the Church of Medjugorje, on the path leading to the cemetery, a large bronze sculpture of the Risen Christ made by the Slovenian artist Andrej Ajdic was placed in 1998. The Christ is depicted as He is lifted up and sustains himself, while in the cross on the ground you can see the imprint of His body: this symbolizes at the same time Jesus on the cross, which has remained on the earth, and the Risen One, because he stands without a cross. Since 2001, a clear tear-like liquid almost incessantly flows from the right knee of the sculpture, which does not evaporate and does not freeze even in the most extreme climatic conditions. It is unknown what this liquid is: it is 99% water with traces of copper, iron, calcium, magnesium, potassium, sodium, sulfur and zinc. You could think of condensation but the amount is about a liter of water a day, 33 times more than normal. At every hour of day and night, rows of pilgrims carrying tissues wipe the small drops from the knee of the imposing statue to bring them to their sick loved ones. The tree-lined path which leads from the church to the Risen Christ has been called Via Domini because it is enriched by the colorful mosaics depicting the Luminous Mysteries of the Holy Rosary, made by the Italian artist Arrigo Paz. Community Sons of Divine Love offers assistance to the suffering and takes care of the liturgical animation of the parish through singing and music. Missionary Sisters of Wounded Family, founded by Sister Kornelia Kordic immediately after the Balkan War, continues to accomodate orphans and elderly people alone.